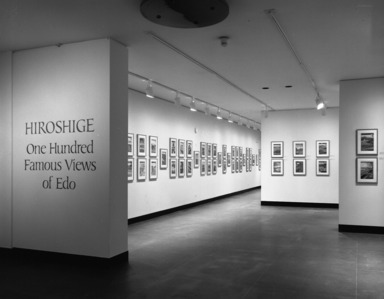 October 1, 1987 The complete set of 118 woodblock prints One Hundred Famous Views of Edo by the 19th-century Japanese landscape master Utagawa Hiroshige (1797-1858) is on view at The Brooklyn Museum through December 6. The works, depicting celebrated places in 19th-century Edo (modern Tokyo), have never before been exhibited as a complete set. The exhibition marks the culmination of a year-long celebration of the set’s publication in book form by George Braziller, Inc. and a series of seasonal displays of the works in groups of 25. The prints were first published between 1856 and 1858 and are noted for their exquisite technical quality and innovative composition in which a close-up of the main subject is placed against distant background scenes. The Museum’s set is one of three complete sets known and is remarkable for its pristine condition. 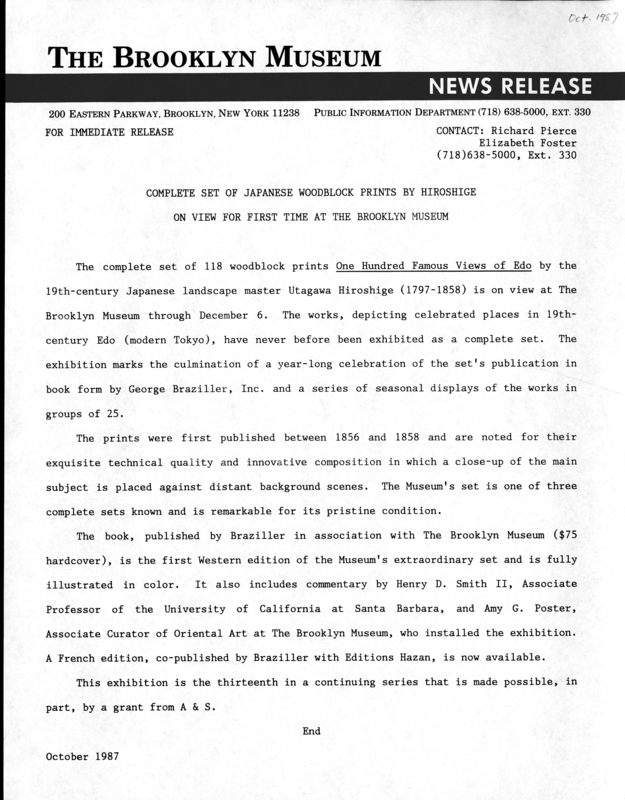 The book, published by Braziller in association with The Brooklyn Museum ($75 hardcover), is the first Western edition of the Museum’s extraordinary set and is fully illustrated in color. 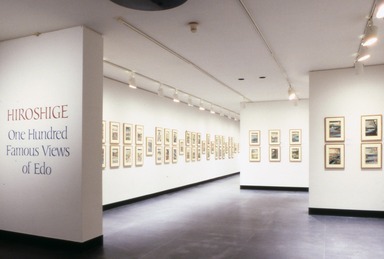 It also includes commentary by Henry D. Smith II, Associate Professor of the University of California at Santa Barbara, and Amy G. Poster, Associate Curator of Oriental Art at The Brooklyn Museum, who installed the exhibition. A French edition, co-published by Braziller with Editions Hazan, is now available. 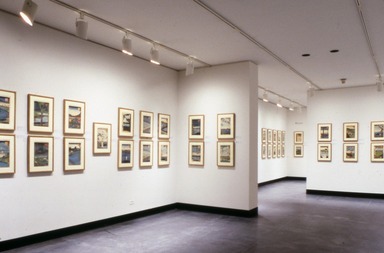 This exhibition is the thirteenth in a continuing series that is made possible, in part, by a grant from A & S.
Brooklyn Museum Archives. Records of the Department of Public Information. Press releases, 1971 - 1988. 1987, 105.